It’s safe to say that every time I have a dinner party, I want to write about it here. And it makes sense, right? I love cooking for myself, and for me and Ben, but there’s something special, something entirely distinct, that happens when you sit down at home with a bunch of people you love over a generous meal and the conversation and wine flow in equal measure and you rise from the table feeling a little more hopeful than before, a little more prepared to face the day ahead. So I’m going to talk about this latest dinner party. If I keep this up, I can give it a name: dinner party dispatches, perhaps…? I’ll try to think of something clever. It’s becoming a bit of a tradition, these ladies-only dinner parties when Ben is out of town. This time, even though it was blazing hot, I stuck with the early autumn dinner I’d planned, starting with baked feta and figs, roasted Italian peppers, and the tiniest, most beautiful multicolored cauliflowers boiled simply. We drank fresh pink bubbles from the Loire, then moved to a Falanghina from Campania that my friend Erin brought (label owned by another cool lady I know, a perfect fit!). Over kabocha squash risotto and a big salad, the conversation moved from one topic to the next. We talked about the presidential debates and falling in love and siblings and divorce and paths not taken and work and everything in between. At one point, my friend Annie told a story about a complicated situation she’s navigating that elicited an oh my gosh me too response from someone else at the table. It was so good to be there, in that space where no one was alone. We finished the night with big slices of apple galette topped with cinnamon whipped cream and splashes of Amaro alongside. Even with all the fans running, wearing summer dress and no shoes, it felt like a most fitting welcome to fall. Later, when everyone was gone and the dishes were done, I dropped the jar of arborio rice that I was carrying to the pantry, and it shattered all over the floor, grains of rice mixed with shards of glass. On a bad day, this might drive me to tears. But not that night. I turned on the lights and swept up the mess as Joni Mitchell’s Blue turned on the record player for the second (third?) time that night, then I poured myself a glass of wine and sat on the couch, feeling that elusive sense of peace. There’s a line in there where Joni sings, “California I’m come home / Oh will you take me as I am.” California isn’t my home home, and though beautiful and nuanced and compelling, the truth is that the Bay Area is as rough around the edges as anywhere I’ve lived. My friends keep moving and the cost of living is out of control and literally every normal life thing feels hard and it all feels a little ridiculous. Yet it is home, for now. And sometimes, when I’m surrounded by friends I met through a combination of jobs and surprising connections and sorrow and serendipity, I think that it really did take me as I am, and it’s given me so much to learn from and so many interesting people to love. At the end of the day, that’s about all a girl can ask for. Especially when there’s whipped cream, too. 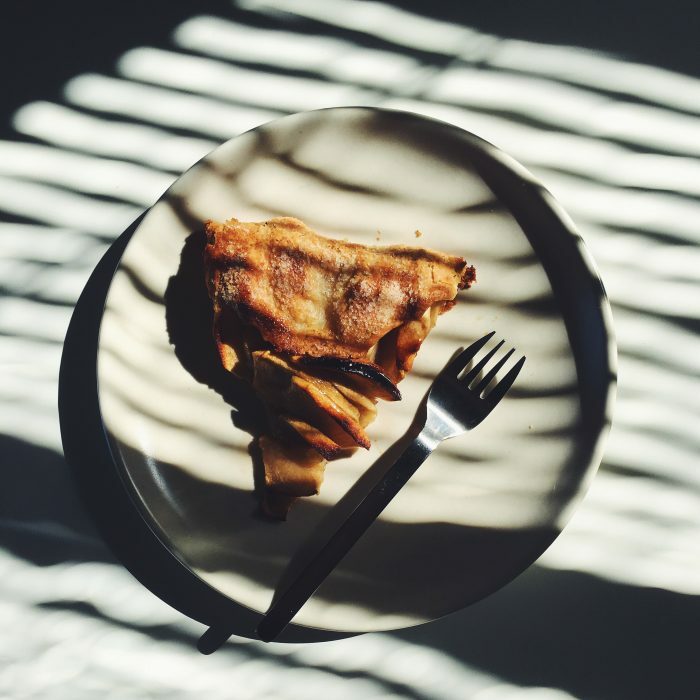 Luisa explains that this galette is the one Alice Waters has kept on the Chez Panisse menu for years, introduced to her by Jacques Pépin before that. It’s incredibly simple, in the best of ways. I recommend serving it with whipped cream, perhaps spiked with a bit of cinnamon. Ice cream or crème frâiche would do nicely as well. Drizzle in up to 3 1/2 tablespoons of cold water, 1 tablespoon at a time, pulsing or stirring after each addition, until the dough just holds together. You might need a little more or less water, depending on your location, the weather, etc. Place the dough on a lightly floured work surface. Gather it together and form it into a 4-inch-wide disk. Wrap the disk in plastic wrap and refrigerate for at least 30 minutes, or up to 3 days. When you’re ready to bake, preheat the oven to 400 degrees. Remove the dough from the fridge and unwrap it. On a lightly floured surface, roll the dough out with a rolling pin, turning it over frequently so that it doesn’t stick and dusting with more flour as needed. Continue until the dough is about 14 inches in diameter and about 1/8-inch thick. Place the dough on a parchment-lined baking sheet. 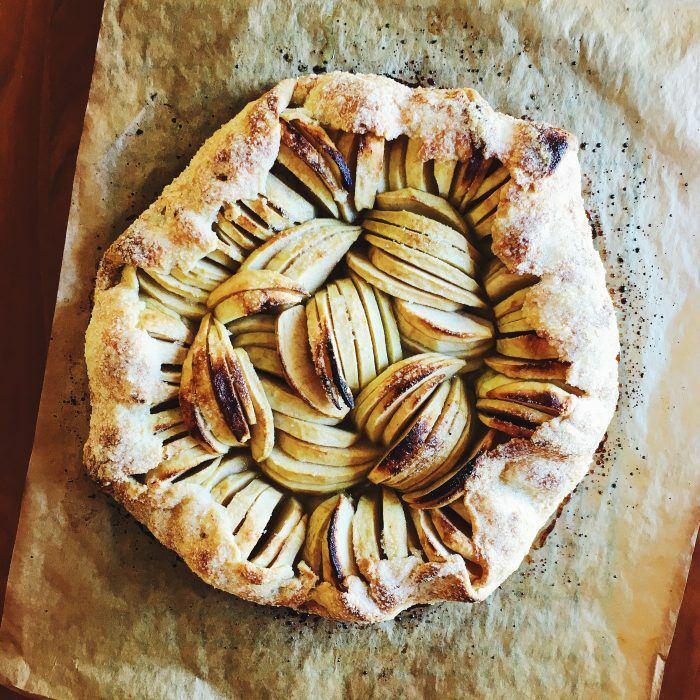 Arrange the apple slices in very tight overlapping circles on the dough (they will cook down and sink apart while cooking, so fill the space generously), leaving a 2-inch border. 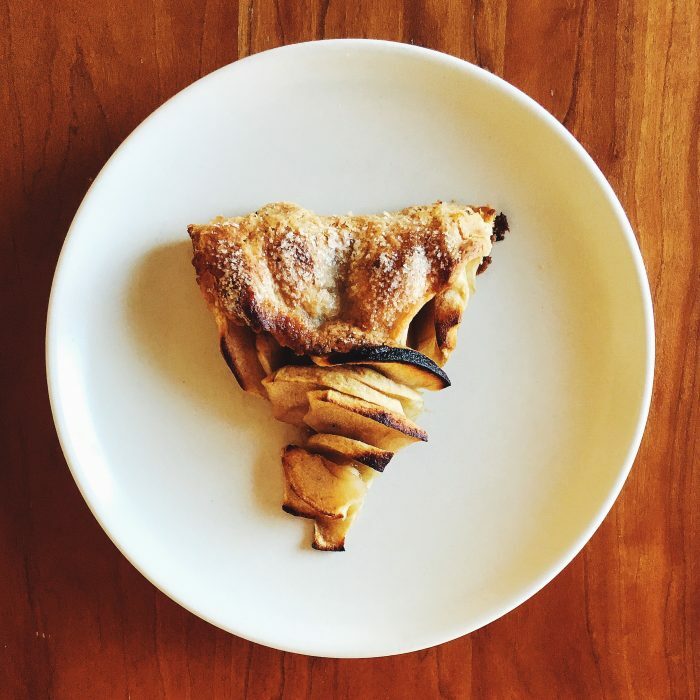 Fold the edges of the dough over the apples to create a rustic crust. Brush the melted butter over the apples and crust, then sprinkle the sugar generously over the entire tart. Bake for about 45 minutes, rotating halfway through, until the crust is a deep golden brown and apples are soft and very dark on their edges. Meanwhile, make the glaze. Put the reserved apple peels and cores in a saucepan with the sugar. Pour in just enough water to cover, then bring to a boil. Cook for 30 minutes. Strain the liquid, discarding the peels and cores, and then return the liquid to the pan. Bring to a low boil and cook until thickened, syrupy and reduced, about 15 minutes. When the tart is finished, pull the parchment and the tart from the sheet onto a cooling rack. After 15 minutes, brush the apple glaze over the apples (it might take a few rounds of brushing to use up the glaze, and you might have a bit leftover, which is fine because it is divine drizzled over yogurt). Serve warm or at room temperature, preferably with some cinnamon-spiked, lightly sweetened whipped cream. Stacy I love your blog and your recipes! I told Ben I have a bumper crop of lemons coming in the year. When they are ready I’ll get some to him along with my recipe for lemon orzo soup (there’s a vegan option). Keep blogging! Thanks so much for the kind words, Lisa! I would gladly accept some lemons and your recipe – what a treat! I look forward to it. Mmmm. This looks tasty! The kabocha squash risotto sounds good too. It sounds like a lovely evening of good food and good friends. Looks super tasty! Is there a type of apple you’d recommend? I have a half dozen granny smiths sitting in my kitchen aching to be baked into something delicious like this. Do you think they would work? I hear you on the Bay Area. I grew up there. Whenever I’m back, it feels like home, yet so foreign at the same time. It’s like chocolate to me, a little bittersweet, but home nonetheless. I think your granny smiths would work just fine! I’m not an expert on apple varieties, but I’ve used many types for this sort of thing with good results. I would love to read more dinner party dispatches. AlwYs wish I was around your table. Curious what you find to be an ideal number of ladies? In an effort to always include the larger group, I end up with a table that breaks off into smaller conversations. Not bad, but I know there is a sweet spot somewhere. Maybe 6? Anyway, this looks amazing and so excited to try a few recipes from Luisa’s book. I think 5 or 6 works well. While 5 sounds small, it’s such a nice size – enough to feel like a party but not so many that you can’t all be part of the same conversation. That’s how many of us there were this time around, and I loved it. This is actually from Luisa’s LAST book – but I can’t wait for her new one! I tested several recipes, and they were all very German (i.e., not quite like anything I’d made before) and delicious. I have 2 lbs of apples waiting to be cooked. Perfect timing. Thanks for sharing your beautiful talent, Stacy! It’s gorgeous Stacy! So glad you liked it.